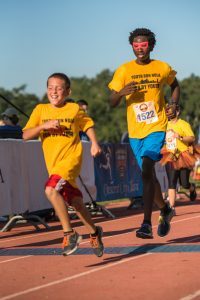 Since its founding in 2010 as an after-school program to promote healthy lifestyles through distance running, Youth Run NOLA has created an empowered community of over 1,000 young runners. While the program began in St. Bernard Parish, Youth Run NOLA now works with 35 public schools primarily in the Orleans and Jefferson parishes. Students come together twice a week to train with their teachers, who have volunteered as coaches, for upcoming 5K or 10K runs and even half-marathons. Additionally, Youth Run NOLA has a park program, spanning six different neighborhood parks, for kids training for a half or full marathon. The park program asks for outside volunteers to act as coaches, and, after training side-by-side over a rigorous four months, forges some of the strongest mentor relationships. Rather than focusing on competition, all of Youth Run NOLA’s leaders work to build a curriculum that emphasizes youth leadership, goal setting, and just having fun. Throughout the year the kids can look forward to pasta dinners before big races, where kids and their families come together to celebrate their hard work. The dinner serves to motivate the kids for their upcoming race while also teaching them how to prepare in healthy ways. The pasta dinners also create a space for the kids to share highlights from their training and what participating in Youth Run NOLA has meant to them. Program Manager Jon Lee recollected how, after a young man completed his first half marathon with Youth Run NOLA, his mother and father decided to join him in running the next year. This year, not only will his mother and father be running a half marathon with him, but his siblings will be too. The culmination of all this training is Youth Run NOLA’s annual 504K through Crescent City Park and the Bywater. The 504K is an opportunity for all the kids in the program to invite their communities and family members to run with them. In 2017, about 1,500 runners participated in the 504K. The kids really look forward to showing their families what they love about Youth Run NOLA, and they carry that love into adulthood. A lot of participants find their passion for running through Youth Run NOLA and will continue to run in college. Over the years, many individuals have returned to participate with Youth Run NOLA in some capacity. Youth Run NOLA’s latest initiative is creating a strong alumni network for young adults who miss their programs and want to have specific roles and responsibilities within the organization. For the past two years, graduates of Youth Run NOLA have been able to return and participate as junior mentors. That Youth Run NOLA leaders have been able to cultivate a lasting love of running, as well as a love for the organization, is a true testament to their success. Erin Cohn is an Edit Intern with Nola Family Magazine.